Kappa Omicron Nu National Honor Society for the Human Sciences (KON) promotes empowered leaders who use an integrative approach to enhance quality of living through excellence in scholarship, leadership, and research. Our scholarships and awards to students and professional members total nearly $35,000 annually. 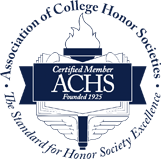 KON is a certified member of the Association of College Honor Societies, and serves 98 active chapters and nearly 150,000 members. Attend Concave 2019! Registration is Open! Strengthen the bonds between chapters, members, and the national organization before returning to lead, learn, grow, and serve in a brand new year! Each active KON chapter is eligible to send one official voting delegate to Conclave, identified through chapter procedures (typically the 2018-19 chapter president or another officer). Any number of chapter members may attend Conclave, but only the official delegate votes for the chapter. At a minimum, chapters are encouraged to support the official delegate with travel reimbursement. KON National reimburses registration for one official chapter delegate.